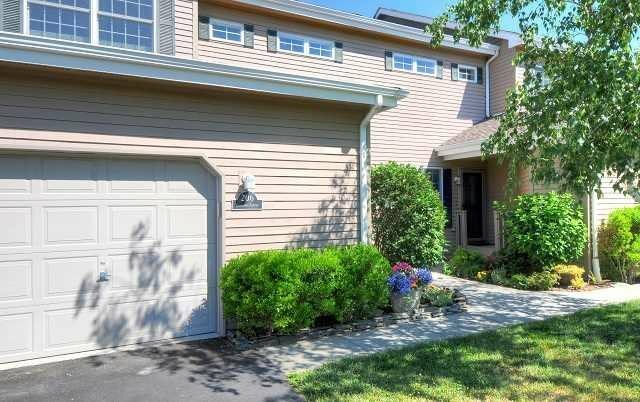 This like-new condo is beautifully sited on a rise above the pond. 2 BR, 2 baths plus den. Brand new state of the art master bath: large walk-in shower with bench, fine ceramic tile and handsome new vanities. Every room just painted. Contractor/owner has added many upgrades: large granite breakfast bar in kitchen with attractive cabinetry above (to ceiling) and below, Franke extra deep sink; select grade oak floors throughout unit; wall of custom cabinets in living room; lighting upgrades in every room. Unit has a wood burning fireplace, a deck off the dining room and balcony off the master bedroom, attached garage, and central air. This is a wonderful place to live. The Gardens has a swimming pool, tennis courts and an exercise room. One can walk or bike into Rhinebeck which is one of the nicest villages in New York State. And if the city beckons you Amtrak is 3 minutes down the road. Come and see this special condo.